For the Michael Angelo Batio song, see No Boundaries (Michael Angelo Batio album). (2009) "Live Like We're Dying"
"No Boundaries" is the 2009 winner's single of season 8 of the reality television show American Idol. It was co-written by American Idol judge Kara DioGuardi, along with Cathy Dennis, and Mitch Allan. It is the first single for winner Kris Allen and runner-up Adam Lambert. It was first performed on the May 19th American Idol final performance show by the season's winner Kris Allen, as well as the show's runner-up, Adam Lambert. A demo performed by Kara DioGuardi herself has leaked onto the Internet as well, but remains officially unreleased. Both Lambert's and Allen's versions of the song however, were released to digital music retailers on May 20, 2009. It is the second American Idol winner single that was released by both winner and runner-up. The first single was "Inside Your Heaven" of season 4, released by winner Carrie Underwood and runner-up Bo Bice. It is also the second American Idol winner single that is not on the debut album of the winner, after Taylor Hicks' "Do I Make You Proud" in 2006, although the song is included in the deluxe edition of Kris Allen's debut album. It was performed on Britain's Got Talent by young boy band Connected. The song overall has received mixed reviews. Between Kris Allen's version and Adam Lambert's version, Allen's has sold more digital downloads to date. Former American Idol producer Nigel Lythgoe described hearing the song as the "only downside" of American Idol's Grand Finale. Misha Berson of The Seattle Times called the song "perhaps the most tuneless, hackneyed earful of 'inspirational' junk that any American Idol has been saddled with in their last chance at victory". The lyrics of the song have attracted particular criticism, with Gil Kaufman of MTV describing them as "a titanic mound of turgid clichés", citing the chorus "every step you climb another mountain / every breath is harder to believe / you’ll make it through the pain / weather the hurricane / to get to that one thing / when you think the road is going nowhere / just when you’ve almost gave [sic] up on your dreams / then take it by the hand and show you that you can". Billboard reviewed each version separately. On Allen's version, they gave a mixed review, by saying "Even though Allen sings lines like 'there are no boundaries,' his modest presentation implicitly recognizes there actually are. And though he sings he will 'climb another mountain,' this is a vocalist who will reach that peak with a trained, experienced guide." On Lambert's version, they gave a positive review, by saying "There's a slight hitch in his voice, but Lambert gets more comfortable as the rock-of-the-'80s orchestration builds to mind-boggling crescendos. Throwing caution to the wind, and maybe even leaving his cake out in the rain, Lambert shows on this towering if inelegant power ballad he can 'weather the hurricane.' The Huffington Post called this song "regrettable" when comparing it to his song ,released as single in 2011, "Aftermath". Allen's single has sold 312,000 copies. 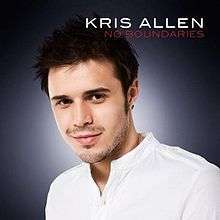 Allen's version of "No Boundaries" entered the Billboard Hot 100 for the week of May 29, 2009, at number eleven, selling 134,000 paid digital downloads. Also, during the same chart week, the song made its debut at number twenty-seven on the Billboard Adult Contemporary charts. 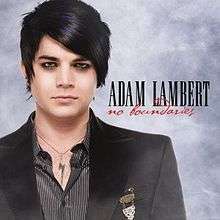 Lambert's version of "No Boundaries" entered the Billboard Hot 100 for the week of May 29, 2009, at number 72, with sales of approximately 36,000 downloads. 1 2 "Kara DioGuardi co-writes 'American Idol' winner's single". The Los Angeles Times. May 19, 2009. Retrieved 2009-05-20. ↑ "Twitter / Nigel Lythgoe". Retrieved 2009-05-21. ↑ "A critic's take: It was a deflating final, but a thrilling season". Retrieved on 2009-05-22. ↑ "What Are The Lyrics To 'No Boundaries' About". Retrieved 2009-05-21. ↑ "Archived copy". Archived from the original on March 29, 2010. Retrieved June 2, 2008. ↑ Billboard.com (2009-05-27). "Idols inundate Hot 100, but Glee gloats with top debut". Retrieved 2009-05-27. ↑ New Zealand RIANZ Singles Chart Archived March 9, 2009, at the Wayback Machine.